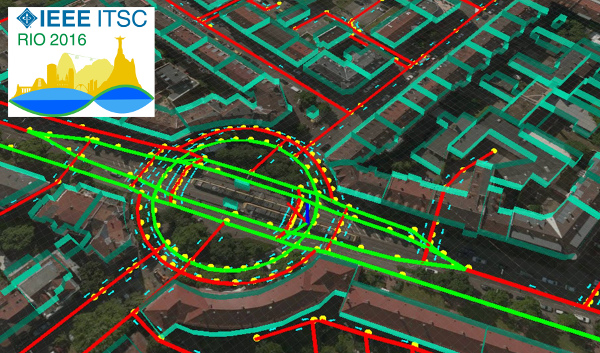 In this project we present a general framework for urban road layout estimation, altogether with a specific application to the vehicle localization problem. The localization is performed by synergically exploiting data from different sensors, as well as map-matching with cartographic maps. Abstract: Detecting buildings in the surrounding of an urban vehicle and matching them to models available on map services is an emerging trend in robotics localization for urban vehicles. In this paper we present a novel technique that improves a previous work in this area by taking advantage of detected building façade positions and the correspondence with their 3D models available in OpenStreetMap (OSM). The proposed technique uses segmented point clouds produced using stereo images, processed by a Convolutional Neural Network. 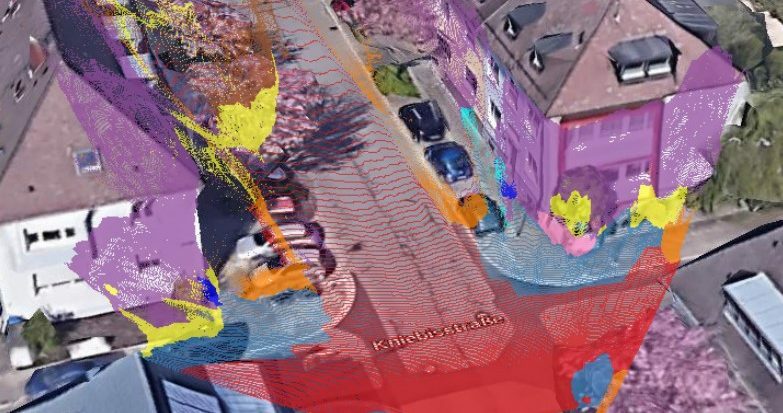 The point clouds of the fac¸ades are then matched against a reference point cloud, produced extruding the buildings’ outlines, as available on OSM. In order to produce a lane-level localization of the vehicle, the resulting information is then fed into our probabilistic framework, called Road Layout Estimation (RLE). We prove the effectiveness of this proposal testing it on sequences from the well-known KITTI dataset and comparing the results the respect to a basic RLE version without the proposed pipeline. Abstract: This paper deals with the task of ego-vehicle localization at intersections, a significant task in autonomous road driving. We propose an online vision-based method that can hence be applied if the intersection is visible. It relies on stereo images and on a coarse street-level pose estimate, used to retrieve intersection data from a digital map service. Pixel-level semantic segmentation, and 3D reconstruction from state-of-the art Deep Neural Networks are coupled with an intersection model; this allows good positioning accuracy with respect to the state-of-the-art in this task. To demonstrate the effectiveness of the method and make it possible to compare it with other methods, an extensive activity has been conducted in order to set up a dataset of approaches to an intersection, which has then been used to benchmark the proposed method. The dataset is made available to the community, and it currently includes more than forty intersection approaches, from KITTI. Another important contribution of the paper is the definition of criteria for the comparison of different methods, on recorded datasets. The proposed method achieves nearly sub-meter accuracy in difficult real conditions. Abstract: In this paper we present a probabilistic lane-localization algorithm for highway-like scenarios designed to increase the accuracy of the vehicle localization estimate. The contribution relies on a Hidden Markov Model (HMM) with a transient failure model. The idea behind the proposed approach is to exploit the availability of OpenStreetMap road properties in order to reduce the localization uncertainties that would result from relying only on a noisy line detector, by leveraging consecutive, possibly incomplete, observations. The algorithm effectiveness is proven by employing a line detection algorithm and showing we could achieve a much more usable, i.e., stable and reliable, lane-localization over more than 100Km of highway scenarios, recorded both in Italy and Spain. Moreover, as we could not find a suitable dataset for a quantitative comparison of our results with other approaches, we collected datasets and manually annotated the Ground Truth about the vehicle ego-lane. Such datasets are made publicly available for usage from the scientific community. Abstract: In this paper we propose a probabilistic approach for detecting and classifying urban road intersections from a moving vehicle. 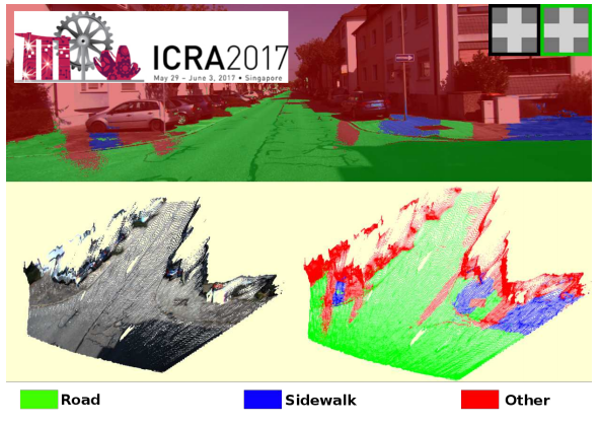 The approach is based on images from an onboard stereo rig; it relies on the detection of the road ground plane on one side, and on a pixel-level classiﬁcation of the road on the other. The two processing pipelines are then integrated and the parameters of the road components, i.e., the intersection geometry, are inferred. As opposed to other state-of-the-art ofﬂine methods, which require processing of the whole video sequence, our approach integrates the image data by means of an online procedure. The experiments have been performed on well-known KITTI datasets, allowing for future comparisons. 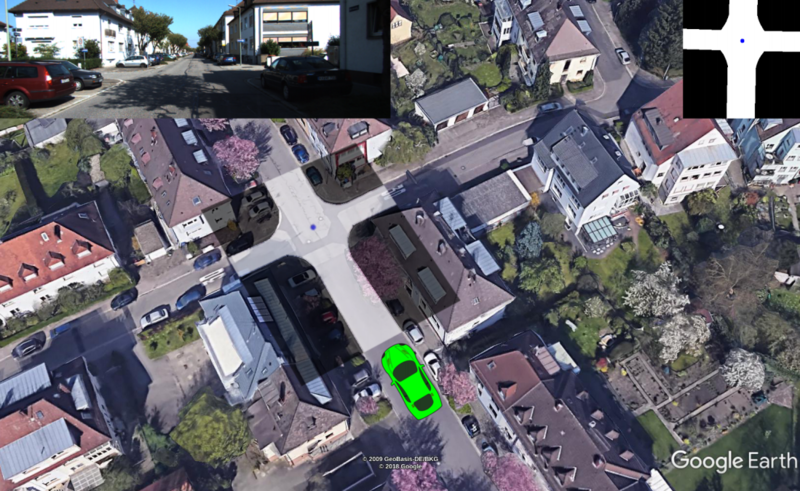 Abstract: In this paper we present a technique that takes advantage of detected building façades and OpenStreetMaps data to improve the localization of an autonomous vehicle driving in an urban scenario. The proposed approach leverages images from a stereo rig mounted on the vehicle to produce a mathematical representation of the buildings' façades within the field of view. This representation is matched against the outlines of the surrounding buildings as they are available on OpenStreetMaps. The information is then fed into our probabilistic framework, called Road Layout Estimation, in order to produce an accurate lane-level localization of the vehicle. The experiments conducted on the well-known KITTI datasets prove the effectiveness of our approach. Abstract: In this paper we present a general framework for urban road layout estimation, altogether with a specific application to the vehicle localization problem. The localization is performed by synergically exploiting data from different sensors, as well as map-matching with OpenStreetMap cartographic maps. 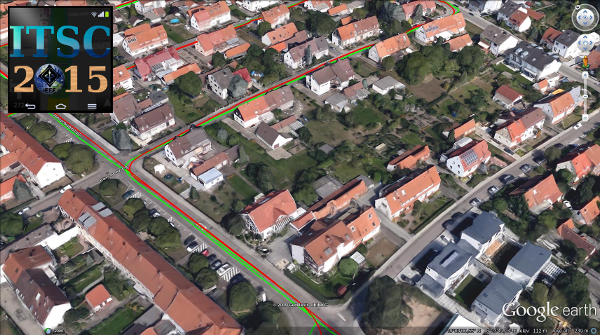 The effectiveness is proven by achieving real-time com- putation with state-of-the-art results on a set of ten not trivial runs from the KITTI dataset, including both urban/residential and highway/road scenarios. Although this paper represents a first step implementation towards a more general urban scene understanding framework, here we prove its flexibility of appli- cation to different intelligent vehicles applications.